We can all agree that for seniors with limited mobility; the primary goal is to remain safe while enjoying an independent life that doesn’t burden their family and friends. Whether the result of surgery or illness, limited mobility can make tasks like getting in and out of bed difficult. Bed standing aids are here to make your life easier and ensure that your caregiver is doing their job correctly by keeping you safe. There are so many excellent products on the market and they all have the same goal in mind: allowing senior citizens to remain independent. If you think you are in need of a bed stand assist, we’ve compiled a list of products to help in your search. What Type Of Standing Aid Do You Need? This handrail is a standard option that goes underneath the mattress to prevent you from falling when getting out of bed. If getting in and out of bed presents a challenge, the solution is simple. The bed rail can be placed on either side of the bed for maximum convenience. The bed assist is a great option because it allows people with limited mobility to maintain their independence and get out of their own bed. Quick and easy, too-free assembly. Latex-free, sturdy construction. No tools are needed and reduces number of pieces to assemble. Height adjustable legs and grip bar. Designed not to slip and to increase stability. Disassembles for easy storage and portability. 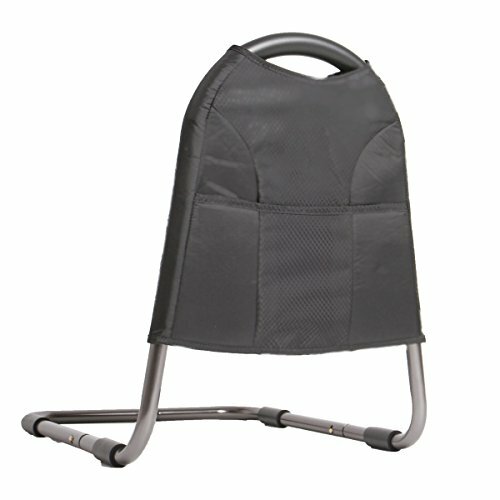 This stand assist is similar to the previous one with the primary difference being the budget-friendly price, which makes it more affordable for seniors on a fixed incomeThis one also comes with a storage pouch so that necessities like your phone or medication are within reach when you need them. The straps fit any size bed. The main consideration when selecting a bed assist bar is whether or not it will hold your weight when you get out of bed. The key benefit of this product is the stability and peace of mind it offers to seniors who need a bit of extra support when getting out of bed. The handle itself is nicely padded, so you do not hurt your hand when you put pressure on it, and it is durable steel. Assembly is not overly complicated and can get done in a few minutes with some help. The height is also adjustable on the handle, so it helps to accommodate people of all sizes. This is an awesome product that offers versatility because you can put it anywhere in your home and it is highly adjustable. 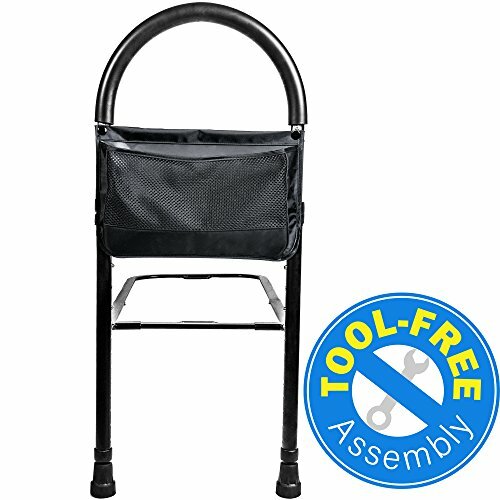 This is an awesome standing aid is an excellent security feature for those who want to age in place safely. The grab bar can be installed anywhere in the home that you may need assistance standing up.. It is most commonly used in the bathroom to get in and out of the tub or to sit down and get up off the toilet, but it is also useful beside a bed or reclinerThe pole is tension mounted so you can quickly and esily move it when it is needed somewhere else. The grab bar in the center has adjustments as well so you can move it up and down depending on how you need it and who is using it. The middle bar also swivels so you can move around it while you are doing what you have to do. The pole is eight feet and extends up to ten feet so you should be able to use this on any standard ceiling that is flat. The pressure the pole puts on the ceiling is also well distributed, so it does not leave any marks or damage even over long-term use. 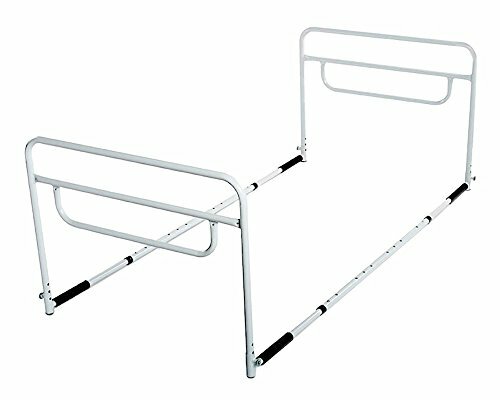 This dual handrail requires no assembly and it is extra sturdy because it runs the entire length of your bed. Unfortunately, it only fits twin and full size mattresses. DUAL Rail. Attaches to both sides of bed for ultimate safety. Easily adjusts height to fit Full & Twin Beds. No Assembly Tools Required. Easy and hassle-free quick installation. The installation sheet is included. 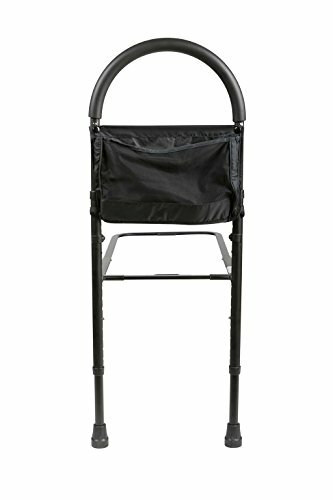 We love this stand assist device because of the safety it provides for seniors on BOTH sides of the bed. The 3-bar design makes it easy to get a grip at multiple heights and the rail lowers when needed to make it easy to get out of bed. It is a strong and durable product that offers heightened peace of mind for seniors who want to live more independently even when a caretaker is available.This bed stand assist requires no assembly at all. You simply combine the pieces and put it underneath the mattress, making it quick and easy to use as soon as you receive it. The rails on both sides of the bed are also large enough to prevent a person from falling out of the bed. The rails are the sturdiest we tested because they run the entire length of the mattress, so they have that constant pressure pushing them down. There is no risk of these breaking or falling out from underneath you when you put your weight on them. There is also rubber padding that prevents the rails from sliding around underneath the mattress. The swinging rail confused us a little bit because we didn’t quite understand why you would want a rail to swing out of the way unless you were using this on a shared bed. Can be placed on either side of the bed. Easy Assembly- Click on image to see our assembly instruction video! 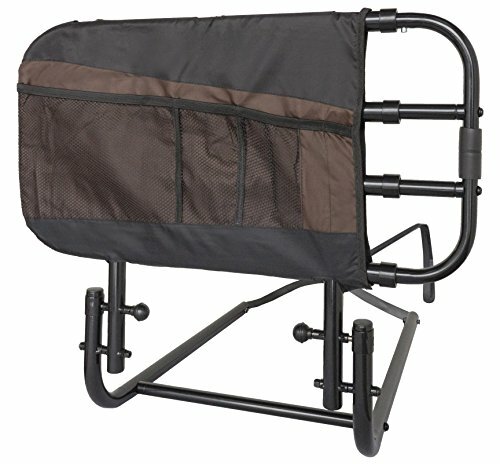 This small rail brings extra durability though a smart design that takes a lot of the pressure off of your when you push yourself up out of the bed. It also comes with a nice storage pouch. This bed stand assist has the great added feature of a built in motion sensor light. We love this bed stand assist for seniors because of its built-in motion sensing night light. This means that you are never left in the dark when you need to get in and out of bed at night, which is important for preventing falls and other injuries. This is the only one that has floor mounts in addition to the rail running underneath the mattress. . This provides an additional level of safety bymaking the rail much more stable. The rubber feet press down into the floor when you get out of bed, locking the rail into place. The entire rail is covered in rubber, which makes it easy and comfortable to grip.The rail is also highly adjustable up to four inches and works for all bed sizes.The Lumarail has a lifetime warranty and a weight capacity of 400 pounds. There are a wide range of products in this category, some offer features that could have a much more positive impact on your life than others. We’re going to talk about the different types of standing aids and what you should be looking for when making a purchase. The majority of the products we reviewed fit into this category. They go underneath the mattress where a strap is tied around them which then goes underneath the box spring. These are the most common, but they are not the most stable option because the strap can become loose. If you have limited mobility, you won’t be able to fix the strap yourself and you may not notice it is loose until it is too late. This does not mean you shouldn’t consider this type of product; it is essential to check the straps regularly before you get into the bed so that you can alert someone that they need to check on it and make sure everything is tight before you get back up. We reviewed a tension-mounted stander pole above and believe it is an excellent tool for preventing falls for seniors aging in place.This is an excellent way to ensure you have the support you need to get up, especially in areas where the floor is slippery or you are completely seated Typically, you find these poles in bathrooms where they are used to help you get in and out of the tub and to help you sit down on the toilet. They are easy to install because they use pressure to hold them in place. This makes the pole easy to remove as well, and it does not leave any damage on the ceiling. There are a few important things to look for in standing aids. You want to keep a close eye on these features and make sure your potential product has them. You need to make sure that the product you are choosing has straps that run around the box spring to prevent the rail from tipping over. Some rails sit using only the weight of your mattress and that might be sufficient for some people who need minimal support. I If you have limited mobility and you put a good amount of weight on the rail to get up, you will likely require a different type of product. The best handrail has a lot of rubber on it to help you grip it better. This enables you to get over to it when you are laying down because you can grab on and pull yourself up. It also helps to make sure your hands do not slip off when you are putting your weight on it. A rail with rubber grips can become dangerous after frequent use because the areas where you put your hands most frequently will become worn down and slippery. This can cause falls, so it is important to inspect your rail regularly to make sure it is safe and sound. Your handrail needs to be adjustable to your needs or else you will get something that is not entirely perfect for you. Not everyone is the same height and not every mattress is the same height so you have no way of knowing if the rail is going to work correctly for you unless you can adjust it to. For seniors aging in place, stand assist devices can give you the confidence to move through your day complete tasks that may otherwise create anxiety. There are a wide range of products to choose from, so decide what your area of greatest need is and jot down the features, sizes, and uses that would benefit you and your space the most. At the end of the day, aging in place should be fulfilling and safe and these products can make your home the safe haven you deserve.